Once you reviewed the hosts and symptoms to determine that Phytophthora ramorum is a probable cause of what you’ve observed, the final step in getting a confirmed diagnosis is to submit the symptomatic plant material to a laboratory for a series of tests. In California, local contacts can further assist with determining whether to collect a sample and where to bring it for analysis. Outside of California, contact local agricultural or Extension staff about how to proceed. 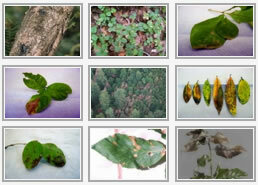 Collect 10 or more symptomatic leaves in various stages of symptom development. Place the dry sample in a plastic bag and keep cool, away from direct sunlight. Bring the sample to the County Contacts at your local Agricultural Commissioner’s or UC Cooperative Extension office within 24 hours. While bark sampling is the only way to directly confirm disease on an infected oak, this procedure is invasive and requires particular equipment from the laboratory; only professionals who have attended a training session should undertake this sampling. Contact a trained arborist or your County Contacts for assistance with bark sampling of oaks.